With the government’s recent push to impose tougher road repair standards, Aggregate Industries is urging utilities firms to make better use of emerging asphalt innovations, in order to keep roads pothole-free for longer. Last month, the Department for Transport (DfT) launched a consultation proposing that gas, electricity and communications firms must fix potholes which form within five years of work that requires breaking and repairing a road – this would be an increase to the current two-year guarantee. This comes amid growing concerns about the deteriorating state of local roads – research recently released by the Asphalt Industry Alliance (AIA) reveals the number of potholes filled in over the last year jumped by a quarter, from 1.5 million in 2018 to 1.86 million in 2019 (so far). Utilities openings in England and Wales are also up nearly 10% over the same period, to over two million. 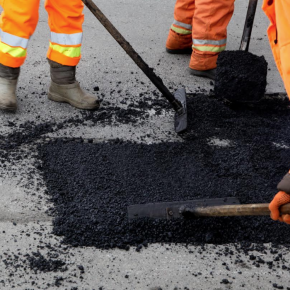 The DfT hopes the new standards will push contractors, working on behalf of utilities firms, to use better quality asphalt materials – a move Aggregate says will be vital to extending the current lifetime of road repairs. According to the leading construction materials supplier, this includes making use of the latest advances in asphalt such as SuperCurve, a high performance 10mm polymer modified asphalt, which has been specifically designed and engineered to provide an enhanced surface course for higher stressed areas. A spokesperson on behalf of Aggregate Industries commented: “With cash-strapped local authorities spending an average of £1.1m – or 8% – of their annual road maintenance budgets on addressing premature maintenance arising from utilities openings, it is encouraging to see the government looking at ways to reduce this cost-burden by raising road repair standards. In line with recommendations made by the AIA, Aggregate is also calling on the government to create a more robust investment strategy for maintaining the long-term condition of local roads through regularly resurfacing programmes, which it says is the best way to prevent potholes from forming. Chris Hudson, MD of Asphalt and Readymix at Aggregate Industries, added: “Potholes are symptomatic of poorly maintained roads and potential underlying structural issues. “All councils have seen a significant decrease in road surfacing frequency in recent years to once every 67 years when ideally they should be resurfaced between 10-20 years. “Rather than having a reactive programme of providing local authorities with last-minute funding to patch up potholes after bouts of bad weather, what we as an industry really need is a long-term funding framework.